When Jerry Seinfeld shows up to President Obama's Oval Office and asks him if he's ready to take a ride with him for his Comedians In Cars Getting Coffee web series, Obama simply replies: "I've got some stuff to do." (Like running a country, for instance.) This classic back-and-forth between Seinfeld and Obama marks the tone for this episode, which will surely go down as one of the show's best (and maybe most unusual, too — because of the President's security restrictions, Seinfeld had to shorten their joyride to White House grounds). But it's during one exchange, where Obama roasts comedian Larry David about his golfing habits, where we see the pair circle from politics to comedy. 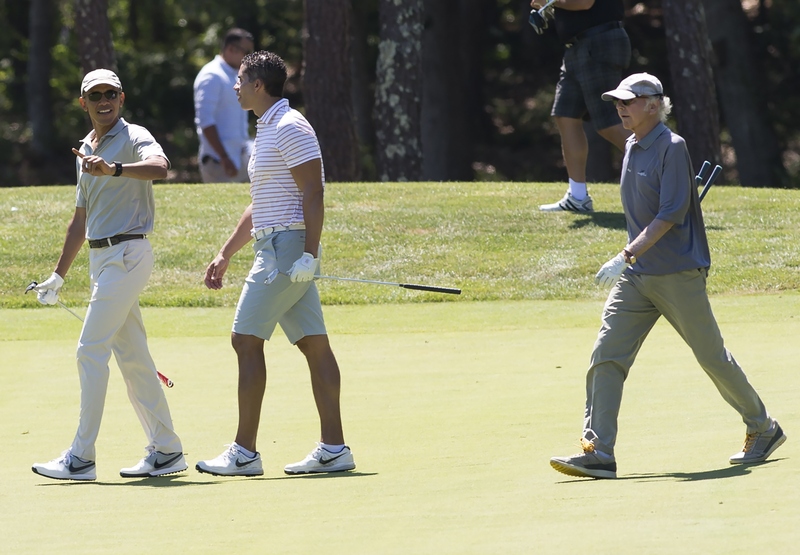 Obama is no stranger to the golf course, and he's known for taking his friends along to swing a club or two. This has included the actor, writer, and co-creator of Seinfeld David on a couple of different occasions, most recently in August on the Obama family's vacation to Martha's Vineyard. According to a White House pool report, the pair had a good laugh: Obama performed his signature leg kick after missing a long putt, and David unsuccessfully tried to maneuver his golf ball out of a sand trap. When we play golf, he's a fair-skinned guy, so he lathers himself in sunscreen. And it's dripping, it's caked white all over. And it catches parts of his ears, and then there's big globs of it. David always gets a big laugh out of his spot-on Bernie Sanders impression on Saturday Night Live (both of them have that grumpy grandpa aesthetic down pat). And now thanks to Obama, Seinfeld, and a cup of coffee, I can also get a good laugh every time I need to use some sun tan lotion — just imagining David's ears caked in globs of sun screen is enough to do it.